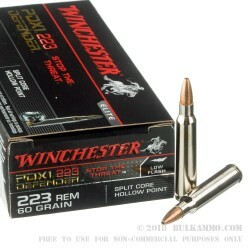 The .223 Remington is a hot round, with the standard 55 grain FMJ scorching along at over 3,200fps. While a great loading for punching tiny holes in paper, sometimes you need something a little more to maximize the viability of the .223, especially if you have pressed your weapon into a self-defense role. Winchester’s PDX-1 was engineered from the ground up to fit this mold, an excellent marriage of a controlled expansion bullet with the reliability, accuracy, low-recoil, and excellent capacity of the AR-pattern rifle platform. PDX-1 takes proprietary bonding technology with a jacketed hollow point designed to provide excellent expansion and threat stopping capability. Coming out of the brake at 2,750fps, the .223 PDX-1 carries a thumping 1,007 ft. lbs of energy at the muzzle, and 723 ft. lbs at 100 yards. 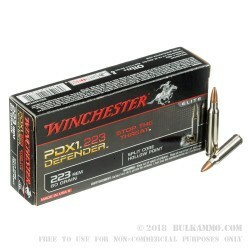 For a point of reference, the mighty .357 Magnum loading of the PDX-1 moves along at a very respectable 1,300fps at 5 yards with 473 ft. lbs. Of muzzle energy. One of the more powerful stock handgun calibers is under half of the velocity and muzzle energy of this hot little number. You can never put a price on peace of mind, but thankfully you can place a reasonable price on Wincherster PDX-1 in .223 Remington. 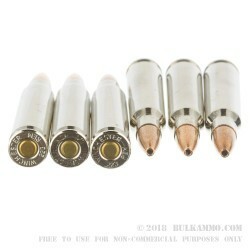 Q: Is this ammo meant for personal defense? 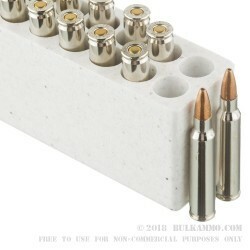 If not what is the purpose of this ammo? Thanks and have a GREAT day whoever is answering this! A: Hello Adam, The PDX1 hollow point round is specifically designed for personal defense. The PDX 1 bullet is designed for maximum energy transfer and controlled expansion throughout penetration.